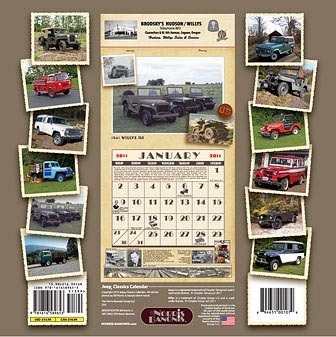 The Jeep Classics calendar is back for 2011, and unfortunately this will be the last year in its present form. 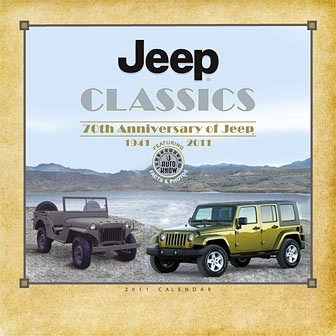 This edition is billed as the "70th Anniversary of Jeep" and it is filled with historic information in the form of extra illustrations, captions, facts and dates. And again this year, each month features a re-creation of a vintage ad for a Jeep dealer, in addition to a big, full color Jeep photo. All of the flatfenders in the calendar this year are military units, including Dan Walton's 1964 M606 in West Virginia, which is a brand new restoration we haven't seen before on CJ3B.info. Strictly speaking, it's not an M606, but it is a pretty rare U.S. Army example of a CJ-3B with some of the M606 options. 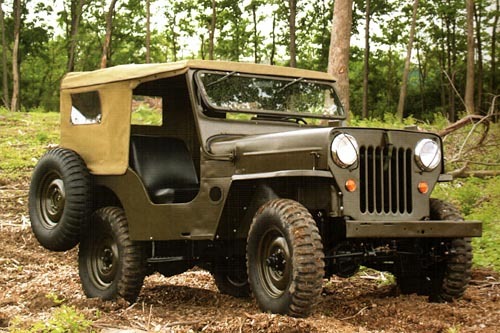 One misstep in the layout of the June page featuring this nice Jeep, is the inclusion of another small photo made to appear to be perhaps an original Army M606, but which is in fact an imaginative restoration of a 1954 3B. The back cover (left) has a preview of the whole year, including the other military Jeeps: Willys MA, USMC CJV-35/U, and an M715 truck. The lineup also boasts a couple of sweet stakebed trucks and a couple of wagons including a Maverick for May, the month when the Maverick package was introduced by Willys in 1959. There's a CJ-5 with a really interesting history, and Richard Kimball's FC fire truck which has been featured here on CJ3B.info. Incidentally, publishers Bill Norris and Kevin Banonis are promising an antique fire trucks calendar for 2012. Bob Christy's "Broken Down Heroes" calendar is also available again this year, with twelve months of beautiful black & white photographs of old vehicles found abandoned. It includes one Jeep this year. "Jeep Classics" and "Broken Down Heroes" can be bought online or by mail. Not available outside North America, due to the terms of licensing by Chrysler. See the most recent year and previous editions of the calendar reviewed on CJ3B.info.